Provide comfort for the family of Jeanne Forkey with a meaningful gesture of sympathy. Jeanne M. Forkey, 84, formerly of River St. in Morrisonville, passed away peacefully in her sleep Monday, January 28, 2019 at the Meadowbrook Healthcare Facility. She was born at Saranac Lake on November 13, 1934, the daughter of the late Homer and Stella (Seymour) Fayette. Jeanne graduated from Plattsburgh High School in 1952 and worked for NYSEG for approximately 6 years before starting a family. She retired from Anderson’s Insuring Agency after 25 years as a licensed agent. She married Clarence Forkey on September 14, 1957 and they had 3 sons. She enjoyed bus trips with the senior citizens groups, working on puzzles, Active Adult Fitness Club, going to the casino and family outings and lunches. She also enjoyed her favorite football team, the New England Patriots. She is survived by her children; Kevin and Denise (O’Connor) Forkey of Pownal, Vt., Steven and Joanne (Ahern) Forkey of Morrisonville, Todd Forkey of Manchester, NH., She is also survived by her grandchildren; Katie (Forkey) Baker and Michael Baker of Morrisonville, Matthew and Keri (Zielinski) Forkey of Plattsburgh, her great grandchildren; Madison and Lauren Baker, Connor and Barrett Forkey. She is also survived by a half brother, Timothy Fayette of Glens Falls, NY. and her step grandchildren; Morgan, Shaun, and James, two sisters in law; Mildred Forkey Sellin and Sharon Forkey, and several nieces and nephews. She was predeceased by her parents, her husband Clarence Forkey , and two sisters; Geraldine and John Anderson and Theresa and Donald Ducatte..
A Mass of Christian Burial will be celebrated on Thursday, January 31, 2019 at 11:00 am at St. Alexander’s Church in Morrisonville. The family will greet visitors 30 minutes prior to the Mass. Interment will be in the parish cemetery at a later date. Memorial donations may be offered to the Clinton County Food Shelf or for Masses. 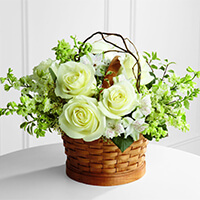 To send flowers in memory of Jeanne M. Forkey, please visit our Heartfelt Sympathies Store. John and Mary Ellen O'Connor sent flowers to the family of Jeanne M. Forkey. On behalf of the Seton Catholic family of faith, and myself, I would like to extend our deepest sympathy to Jeanne's family (especially Katie and Matthew) and friends. May she rest in peace and may the angels lead her to her heavenly home. Sincere sympathy on the loss of a wonderful lady who will truly be missed. John and Mary Ellen O'Connor purchased the The FTD Peaceful Garden Basket for the family of Jeanne Forkey.